Very nice work from you guys ! I don't like the ending... but the rest is really really nice. Cheers to the Paradox crew! 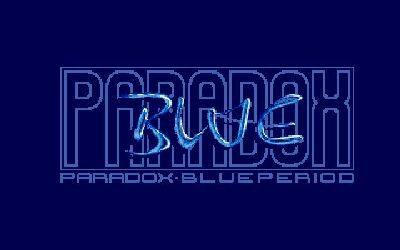 The cool guys from Paradox hit again with a cool party demo. Nice blue dream I spent while this other Paradox production =) Thx guys ! The demo looked really nice (3d bee!) allthough I was missing some famous atari content/storytelling. tune by 505 rocks hard! very nice STe demo with a "good feeling" :) thumbs up! Nice demo although it ends a bit suddenly :) High quality effects, great music by 505 and a really cool logo by Ukko! Considering the putting together and music were actually done on the party - i like it! Great demo with nice tune! Nice demo, and great tune. Is there a MP3 of it? The version for 1MB STEs in out now, too. If you like, download at http://paradox.atari.org. 3D bee forever !!!!! the rest is also very nice and well presented. Quality prod as always. rulez added on the 2011-07-16 15:00:00 by ɧ4ɾɗվ. Nice demo but the tune is seriously great. Fine little demo with really cool music. Stylish.. but Hatari struggles to playback the sounds during loading. Not sure why. Otherwise this is amazing stuff - love that bee! Really nice work. 505 what a great track! page created in 0.016671 seconds with 15 queries.